Lendwithcare.org, created for CARE International UK by Bluefrog, has won a Third Sector Excellence Award for Best New Website in 2011. So what is it about Lendwithcare that’s got the fundraising industry talking, and engaged thousands of supporters? Through the website, donors can have a direct impact on the lives of people in the world’s poorest countries – by lending, rather than giving. Most importantly, through updates, photos and videos, they can see the difference they are making. Microfinance is a vital tool for many development organisations, yet it’s a concept that donors often struggle to understand or connect with. Lendwithcare.org has found a way to make microfinance clear, accessible and exciting. As a consequence, thousands of ‘lenders’ have signed up to the website and almost a quarter of a million pounds has been lent to entrepreneurs in the developing world. Lenders are also turning into CARE donors. Once supporters’ loans have been repaid, 70% decide to start giving to CARE International. Bluefrog’s approach – creating a direct connection between donor and beneficiary – is central to lendwithcare.org and the success that it’s achieved. 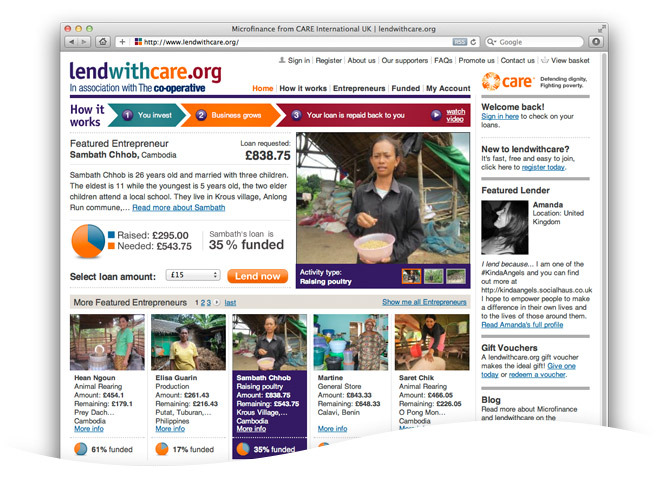 Lendwithcare.org is CARE International’s second award winning website, with MyCareZone.org (also produced by Bluefrog) winning a Third Sector Excellence Award for Best Use of Digital Media in 2010.